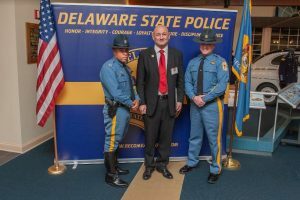 Superintendent of the Delaware State Police Colonel Nathaniel McQueen Jr.
Dover – On Wednesday, January 9, 2019, the Delaware State Police held a ceremony which recognized both the outgoing Honorary Commanders for 2018 and welcomed the newly selected Honorary Commanders for 2019. 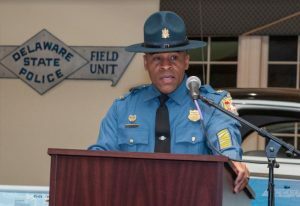 This prestigious event led by our Superintendent, Colonel Nathaniel McQueen Jr. took place at the Delaware State Police Museum located at 1425 North DuPont Highway, Dover. 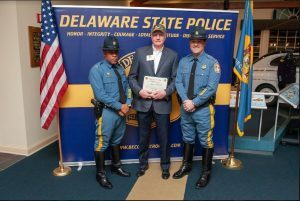 The Secretary of the Delaware Department of Safety and Homeland Security, Robert Coupe and the Superintendent of the Delaware State Police, Colonel Nathaniel McQueen Jr. spoke at the event and helped recognize the importance of the ceremony. Mr. Xavier Teixido is the president of Harry’s Hospitality Group, which operates three concepts in Wilmington, DE: Harry’s Savoy Grill, Harry’s Savoy Ballroom and Kid Shelleen’s Charcoal House & Saloon. He has held the positions of Chef and General Manager at the Frog and Commissary restaurants in Philadelphia as well as the Managing Director of Commander’s Palace in New Orleans, where he worked with the famed Brennan family and Chef Emeril Lagasse. Mr. Elvis Gisiora was born and raised in Kisii, Kenya. He immigrated to the USA in the summer of 1996. He is the owner of Gisco Enterprises, LLC. 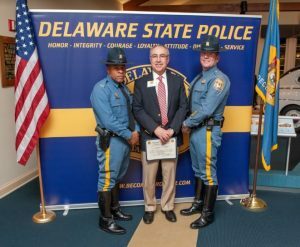 Mr. Gisiora has an abiding passion for community service and has been actively involved in different activities, programs and efforts for over the past 15 years. 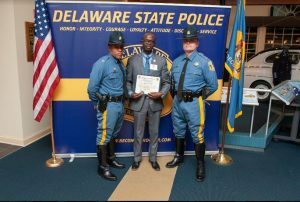 He is also the Community Outreach Facilitator for his church, Angaza Sharon, in Newark, DE. 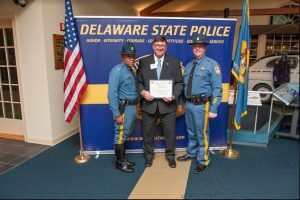 Mr. Tony Davis is an area manager with Wawa, overseeing the operation of 14 stores in New Castle County. Mr. Davis has been with Wawa for 25 years and began his career as a 16 year old cashier. Mr. Davis lives in Southern Chester County, PA with his wife and three sons, and is a huge Eagles fan! 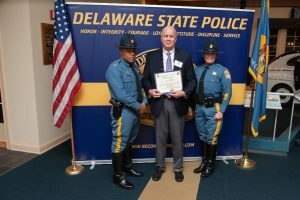 Mr. Denis McGlynn is the President/CEO of Dover Motorsports, Inc. & Dover Downs Gaming & Entertainment, Inc. Mr. McGlynn graduated from Pace University with a BBA in Marketing in 1968. Mr. McGlynn was an officer in the U.S. Air Force from 1969-1972. He has been with Dover Downs Gaming & Entertainment, Inc. and Dover Motorsports, Inc. for 47 years. Mr. Bob Ricker joined the Georgetown Fire Company in 1975 and has served as Fire Chief, Deputy Chief, Assistant Chief, Vice-President and Board of Directors and currently serves as Secretary. Mr. Ricker served as Mayor of the Town of Georgetown for two terms, Vice-Mayor for one term and 5 years on the towns planning Commission. In 1985, Mr. Ricker and his wife purchased the family business, Baker’s Hardware in Millsboro. Together they have transformed a small hardware store into one of the most successful Outdoor Power Equipment dealerships on the east coast. Mr. Bob Carey is the Executive Director at Delmarva Adult & Teen Challenge. He pioneers a Teen Challenge residential center for men struggling with drug & alcohol addictions. 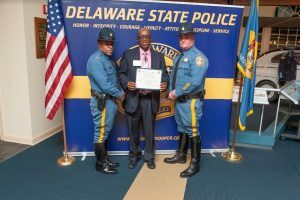 Mr. Carey planted the center in Seaford, Delaware on ‘Third & North Street’ known as ‘Crack Alley’. Over the last 10-years, 225 men have graduated the 12-month residential program and have continued to live a life of purpose, freedom and joy. The program has documented a 93% success rate to those who complete the program. 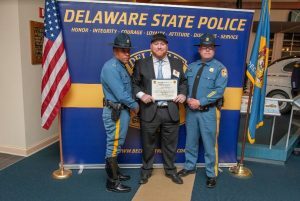 Mr. Carey looks forward to making a significant difference in Delaware for those whose lives are on a ruinous course due to drug addiction. Mr. Walter “Reds” Ferris is the owner of Ferris Home Improvements. He grew Ferris Home Improvements from his parents’ basement to a company that manages over 150 people and grossed over $15 million this past year. 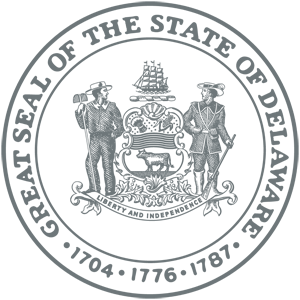 Ferris Home Improvements has won numerous awards for excellence in professionalism, rapid growth, and community service. Over the last 14 years, Mr. Ferris took what he learned and continued growing as an entrepreneur, partnering to open a successful real estate investment company, a successful bar, a restaurant, and will soon finalize purchase of another bar in the Pike Creek area. Mr. Ferris has been just as active in the community as he is in the business world over the last 14 years. 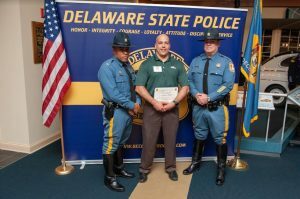 Mr. Diaz Bonville attend Delaware Technical and Community College in Georgetown, Delaware, where he received an Associate’s Degree in Human Services with a strong concentration in program management and administration. He is the Co-Founder/Volunteer of the West Rehoboth Children & Youth Program, a community based after-school and summer enrichment program for at-risk, low-income, disadvantaged youth. Mr. Diaz has over thirty years of experience in mobilizing and organizing at-risk communities, children, youth and their families, church and after school and summer enrichment programs. Mr. David Zickafoose graduated from West Point in 1999 and was commissioned as an Infantry Officer in the United States Army. During his time in the military he served combat tours in Afghanistan ’03 and Iraq ’06. His primary duty in Iraq was rebuilding the Iraqi police force in the Sal ah Din Province. He facilitated in the training and supply of over 5000 officers to include operations for the first democratic election in the country. After the military Mr. Zickafoose worked for a major biotechnology company in the development of cancer medication. 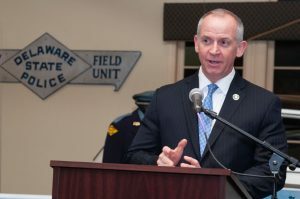 He currently runs two school bus companies that serve the Appoquinimink, Caesar Rodney, and Capital school districts. 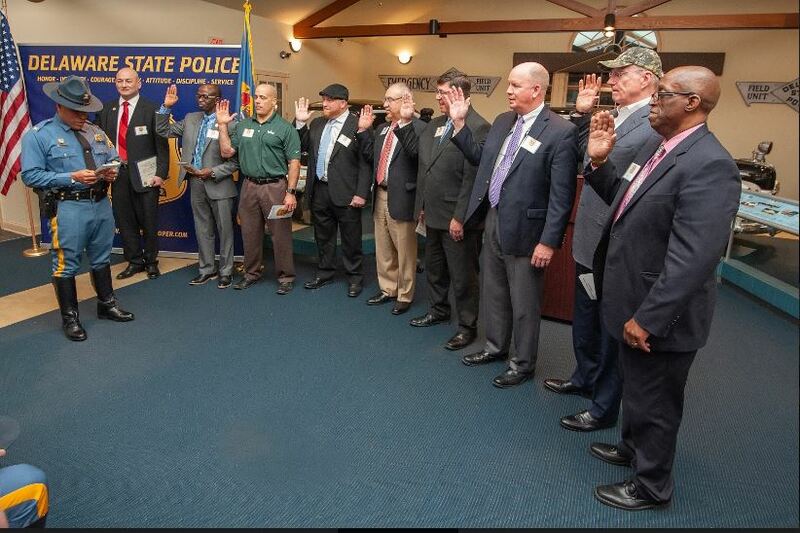 Both the Delaware State Police Troop Commanders and the newly selected Honorary Commanders are looking forward to their mutually beneficial partnerships and working alongside each other throughout the state this coming year. 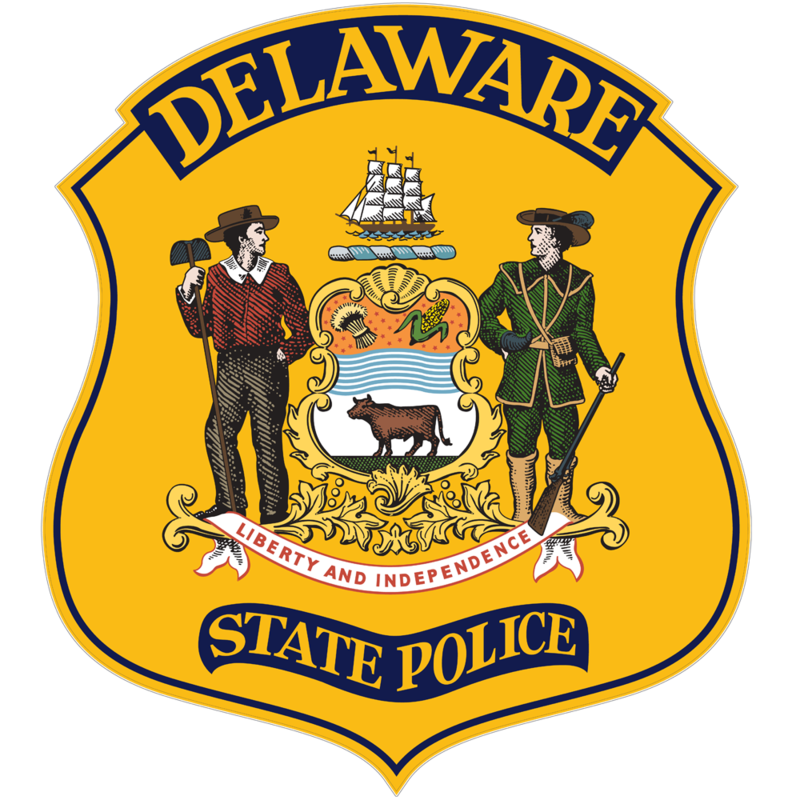 Our Superintendent, Colonel Nathaniel McQueen Jr. and the women and men of the Delaware State Police express our gratitude and thank all of the amazing and talented Honorary Commanders for their participation in this highly honored program. This well-regarded community program brings police and civic leaders together to enhance the partnership with the communities we serve. Congratulations on your selections and thank you for your commitment to serve others.